Is the culture of “Alabama to NFL” frustrating Nick Saban? Even in disagreement, Nick Saban’s players are an extension of him. 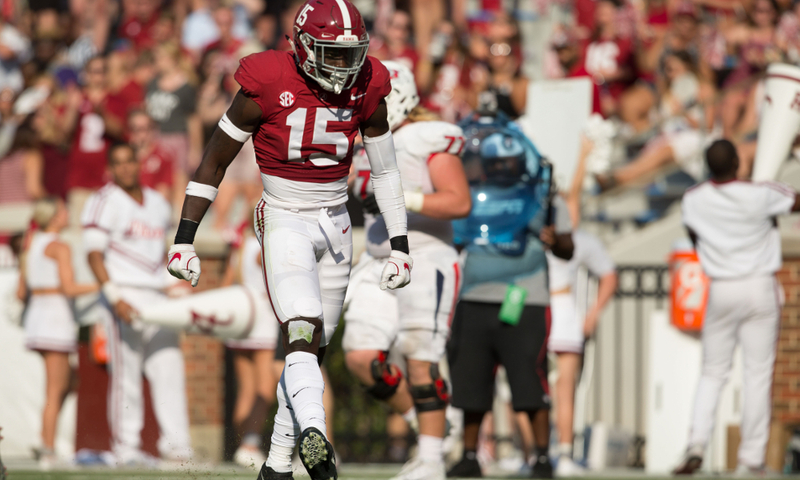 Upon the conclusion of Alabama’s second scrimmage on last week, one of the main aspects Saban tackled was the ongoing turnover he faces with players declaring early for the NFL Draft. As much as he would like to see them excel, the five-time national champion understands the nature of the business and would rather have players rationalize each decision. For the ones that earned concrete status as first or second-round picks, Saban said very rarely has he seen those guys fail at the next level. While he believes there is a trend causing the issue, one of Saban’s former players took his statement personally on social media. Ronnie Harrison, a third-round pick of the Jacksonville Jaguars in the 2018 NFL Draft, starts for the franchise at safety. The 6-foot-2, 207-pounder posted his rebuttal to Saban’s comment on Sunday and was confronted by fans on Twitter. He played under Saban for three seasons (2015-17) and was a fixture in the program winning two College Football Playoff national titles. During his junior year, Harrison collected 74 total tackles – including 4.5 for loss with 2.5 sacks. The native of Tallahassee, Fla., would also four pass breakups and three interceptions. To Saban’s point, Harrison pockets just $3.38 million on a four-year deal via Spotrac and his contract did not come with any guaranteed funds. It would have been better if Harrison returned for his senior year; nevertheless, one must take socioeconomic background into consideration. What if Harrison, who lost his father prior to pursuing a pro career, grew up in a rough part of Tallahassee? Now, he has to deal with a way to provide for his mother and other immediate family members that have sacrificed for him on his journey. So, in his mind, Harrison perceives the $3.38 million as a blessing – especially if he is not used to seeing a large sum of money. As a hardworking man from West Virginia, Saban is all about seeing people he’s taught earn what their value is. However, the culture at the University of Alabama has become if you go through Saban, one will make it to the NFL. The thought is no longer on what spot one may be selected in, but it’s rather based on Saban’s acumen. With him being respected by all 32 pro teams and much of them attending activities around Tide football, some players feel as though doors to the NFL should be open to them as long as they come from Saban’s teachings. Coming from his perspective, Saban wants players to take into account that scouts and analysts do not know everything about the draft. Just because you may have received a second, third or fourth-round grade does not mean it is valid, seeing how there is much politicking in sports. This is the reason why he is starting to get in front and change the narrative in recruiting. He wants everyone to be successful, but has the culture of Bama to NFL created more frustration than joy for Saban? About 68.8 percent of the league (22 of 32 teams) have at least one former Crimson Tide player and that number will increase after the draft coming later this month. It will be a young team for Alabama on defense in the fall, but Saban will have to deal with it.